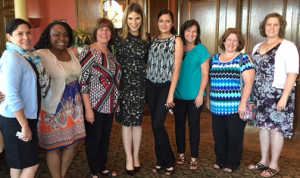 Jenna Bush Hager (center), daughter of former President George W. Bush and a correspondent on NBC’s Today Show, is flanked by Mickey teammates at The Salvation Army of High Point’s Champion of Hope dinner this spring. Ms. Hager is a best-selling author and Chair of UNICEF’s Next Generation. In her keynote message during the evening focused on how lives can be changed with compassion, community support and educational opportunities. Former U.S. President George W. Bush and Former First Lady Laura Bush are strong supporters of The Salvation Army. From left: Mickey’s Margie Richardson, Kika James, Gail Wells, Bush, Genesis Diaz, Gina Huffman, Dana Layne, Lisa Brunton.